After taking most of the year off to spend time with my college-bound daughter, and to get ready for the art show and lecture I delivered in Bellevue in the summer, I’m finally ready to start painting again. This time, my inspiration was a color scheme from one of my favorite paintings. I rarely begin a composition thinking about color, so this is unusual for me. 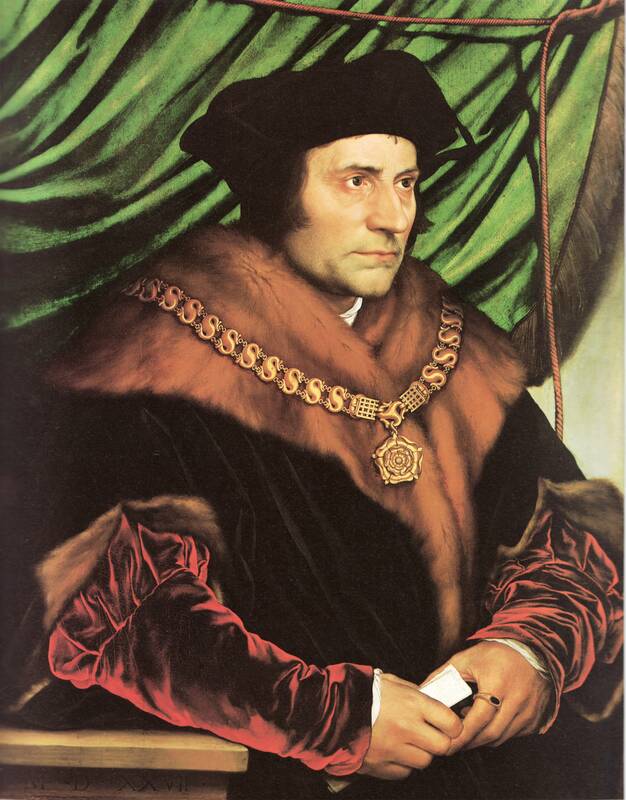 The painting is the portrait of Sir Thomas Moore by Holbein that hangs in the Frick. I always visit it when I’m in NY. I love the strength of character portrayed in the painting, as well as the striking composition and rich colors. The first prop I wanted was some green cloth. I found something suitable at the fabric store- not exactly what I wanted, but close enough. I find that I need my props to be very close to the correct colors for me to be able both to design a composition and to paint it. I can’t imagine color relationships and reflections. I must see them. Occasionally, when a work is well under way, I will alter a color from the set-up in order to improve the picture. I can do it because at that late stage in the painting, enough of the canvas is completed for me to be able to judge the work as a whole from looking at the canvas and not just from the set-up in front of me. I can usually guess at any altered reflections at that stage. The first thing I did was to drape the green cloth on the wall. 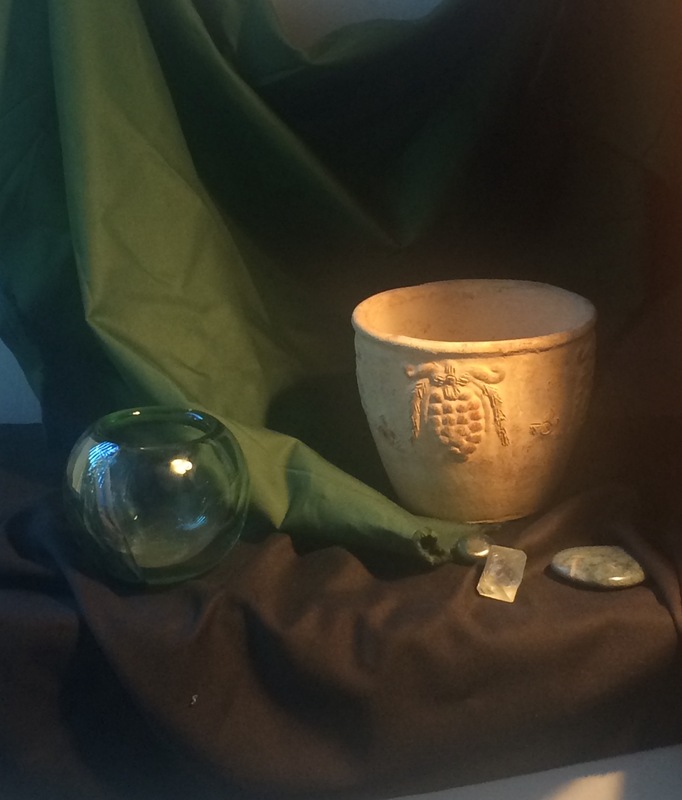 I added a black cloth on the table top to add some darkness, and placed a vase, a bowl, a crystal, and some stones on it in harmonious colors. The set-up looked dull to me. I added a tan stone to echo the color of the pottery bowl, moved the small blue-green stone so it was more visible, and placed the yellow crystal nearer to the pottery bowl to better lead the eye up to it. Finally, using the portrait as my guide, I decided to add a touch of intense red. I found a red cord with a tassel on the end, and placed it in the glass bowl. Red and green are opposites on the color wheel. Bringing together opposite colors always creates a vibrant effect. Too much contrast, however, is jarring. Just this touch of red brought a vibrancy to the set-up. It also brought out the reddish cast in both the pottery bowl and the tan stone. I’m now pretty happy with the composition. I like the dynamism of the folds in the green cloth, the color harmonies, and the simplicity of the major forms. I’ll live with it for a while before I do the final drawing.